On the 15 hour plane ride down to Sydney, Australia I watched The Visitor on Quantas' movie on demand. This movie is so sweet and sad, but so joyous at the same time. It's about a ecnomic professor (the Dad from 6 Feet Under and gym manager in the Coen brothers new movie "Burn After Reading) that has lost all vibrancy in his life until he befriends illegal immigrants Tarek and Zainab, a Syrian percussionist and his Sengali girlfriend who bring a new music into his life. 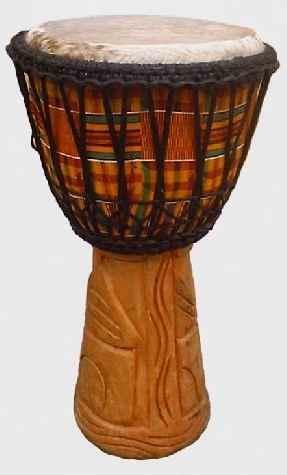 There is mention of Mozart, Fela Kuti, the African djembe, the Chinese erhu, drum circles in Washington Square in NYC and specific African rhythms. This is a wonderful movie. Please check it out. I visited the San Francisco Asian Art Museum last night and, as typical, I parked myself next to the music section in the gift shop and checked out what they had. After being entertained by some cool Afghan dance music, I found this (watch the video) and knew I had to tell you about it. 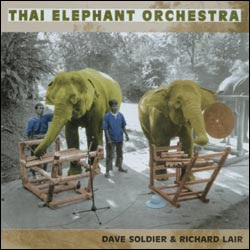 American Richard Lair has trained elephants how to play music in Northern Thailand, much like those that have been taught to paint. Lair and his assistants teach the elephants how to play instruments and then conducts them in concerts for visitors. These instruments are specially made elephant-sized traditional percussion and string Thai instruments. Other than the harmonica, which the elephant can grasp with the tip of its truck, the elephants play instruments that can be struck with either a mallet or with a bare trunk. "For some of the elephants is just a job, but for four or five of them they really like to play, and two or three and absolute musical geniuses. "The orchestra is interesting because the elephants don't play tunes, but what they really do have is a really strong sense of rhythm and that is really where the secret is. I think the music is wonderful because it is not written down. You really have to open up your mind and open up your heart because you never know where it's going." I love where the narrator points out that the deity Ganesh is an elephant. It's no surprise to many people, especially the musician in this video, that elephants can be accomplished musicians. Read more about the elephants and their "imitation" of music in this article by composer, academic and producer of the Thai Elephant Orchestra records David Soldier. You'll find the part on the Thai Elephants on page 4. I don't know if anything can be called musical "imitation," but then it depends on your definition of music which is Soldier's whole point. I definitely call what these elephants do music, but I don't know if I personally would listen to the whole CD at home. But if and when I go to Thailand, I will gladly pay to see them perform, but then again I feel that way about a lot of music I see around me. For those of you who haven't seen this video yet, PLEASE do yourself a favor and watch it. I don't care if you are Christian or not, either way, this is one of the best things I've seen in a long time. And thank you to Dougsploitation for finding this in his collection of VHS and posting it on the web. 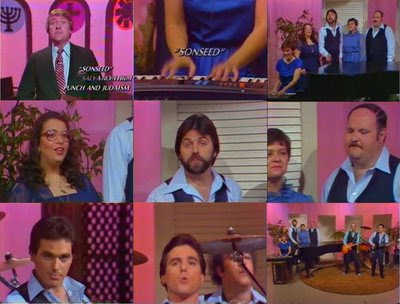 Introducing Sonseed and their number one hit "Jesus is My Friend": the best Christain Ska band in the world! Too bad they could cross over into the mainstream like Creed or Jars of Clay (who I happen to like). Did you know that according to wikipedia, there are dozens of Christian ska bands. Who knew? - The hairdo's, clothes and backdrop. I love pink and blue, don't you? The 70s were fantastically pastel! But Jesus found me and touched me deep down inside. and he'll zap you anyway he can. - The realization that this is actually catchy and the band is totally tight! - Watch the guitarist. He's totally rocking out. - Gotta love those backup singers. Especially the glasses. - The tv host calling the performance "beautiful" at the end. For those of you who want more Sonseed, you can download the entire album here. I honestly haven't listened to it yet, but when I do, I will get back to you. For those of you who want to here some "traditional" British Ska, here's "Too Much Too Young" from the Specials. Brooklyn based Antibalas served as my introduction to afrobeat and its Nigerian creator Fela Kuti. I've seen Antibalas perform at least six times since 2003 and they continue to be one of the best live shows around. I like to dance, but not just to anything, it takes a special kind of groove to get me going. With a four/five piece horn section and three person percussion section, these guys do not disappoint. Today Antibalas played an afternoon set at the Treasure Island Music Festival in San Francisco. For those that do not know the Bay Area, Treasure Island is located in the Bay between San Francisco and Oakland, and the views are postcard worthy. The highlight of todays show was the fiercely political song "Indictment." Stuart Bogie, took the lead vocal as well as giving musical cues with the energy of one possessed. Watching him during this number is pure entertainment. What I really love about Antibalas, and afrobeat in general, is the radical politics that automatically come with the music. Due to the political life and times of Fela Kuti, afrobeat is aggressively anti-authoritative and populist by definition. And in light of the Bush administration, Antibalas' message is loudly heard. The song "Indictment" is not only an awesomely composed and executed afrobeat song, it is politically very specific. No one in attendance will miss its meaning. At the Treasure Island Music Festival, the crowd was totally into the song even before the vocals started, but when Stuart Bogie screamed "Condoleezza Rice! Indictment!" The crowd went nuts, almost taking them by surprise at its forcefulness. He continued to list "George W. Bush! Indictment! Donald Rumsfield! Indictment! Order in the court!" But my favorite of the day? "Bill O-Reilly! Indictment!" I would love Steven Colbert to get ahold of that one. Watch this short clip from the Langerado Music Festival in Miami of the same song. If I can find a good clip of today's performance on youtube, I will add it. Check out their myspace page as well as the track called "Takatif" that's in my playlist over there to the right. I've also added "Indictment" to the playlist for now. Antibalas is now playing in Fela! A New Musical about the life of Fela Anikulapo Kuti until October 5th off Broadway in New York City. I've heard it's very, very good. Check out this very cool story about one of my favorite rockstars. 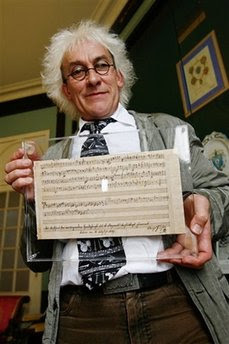 A single sheet of a melody sketch handwritten by none other than the great Wolfgang Amadeus Mozart was found deep in the bowels of a French Library in the town of Nantes. I love this Einstein-looking guy too (Nantes vice-mayor Jean-Louis Jossic), don't you? He must be completely over the moon about this. 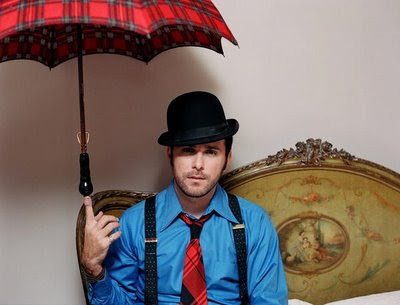 Check out his dorky musical tie!! Love it.